This entry was posted in Brad Stevens, Butler, NCAA Basketball and tagged Brad Stevens, Butler Bulldogs by stlcupofjoe. Bookmark the permalink. As Purdue University grads, with a daughter attending Butler University, my husband and I have never followed the NBA. We have always been college basketball fans ONLY… Now that Brad Stevens is coaching an NBA team, however, that might change. 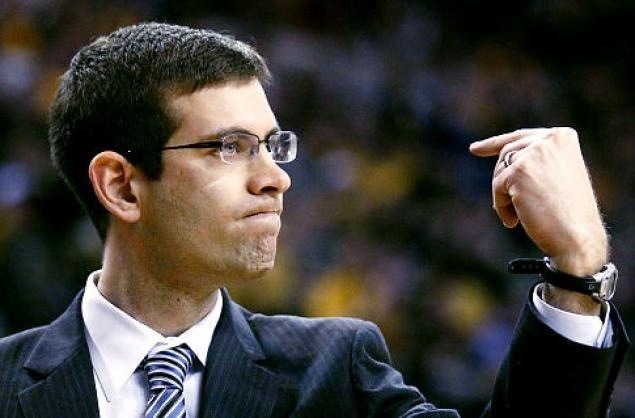 Brad Stevens is a class act, and we look forward to seeing him leave his mark in NBA coaching! As painful as this is to say to a Cardinals writer, this was excellent. Very well done. I still haven’t decided if I will be rooting for Stevens as a Celtic or hoping he fails so he can return to the college game. GREAT COMMENTARY on Brad Steven’s legacy at BU. May I say I had a conversation with Coach Hinkle in late ’60’s as I was a mere lad of 8, and thought BU could compete with Coach Wooden’s Bruins. As a 4 year letterman at BU in early ’80’s, I saw how difficult that would be. I supported Brad for the head coaching position to Barry Collier after only a few conversations with Brad over a few years when Todd left for Iowa. Brad, you helped one’s dream come true, not once, but twice. This Pharmacy major and marginal player is proud of what your leadership accomplished! I’m sure Coach Hinkle has been smiling for a long time now! Best wishes for continued success in Boston.